Freddy X. Muñoz is an Associate in Perez & Rodriguez’s commercial and construction litigation practice groups. 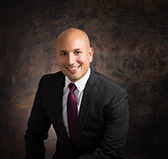 Mr. Muñoz’s practice includes the representation of banks, creditors and business owners in commercial disputes, as well as construction lenders, homeowners, developers and contractors with litigation disputes stemming from contract, design, delay, defect and insurance related matters. Prior to attending law school Mr. Muñoz worked as a Certified Public Accountant for a leading international consulting firm advising clients on financial and operational process optimization, risk management, and compliance with the Sarbanes Oxley Act.